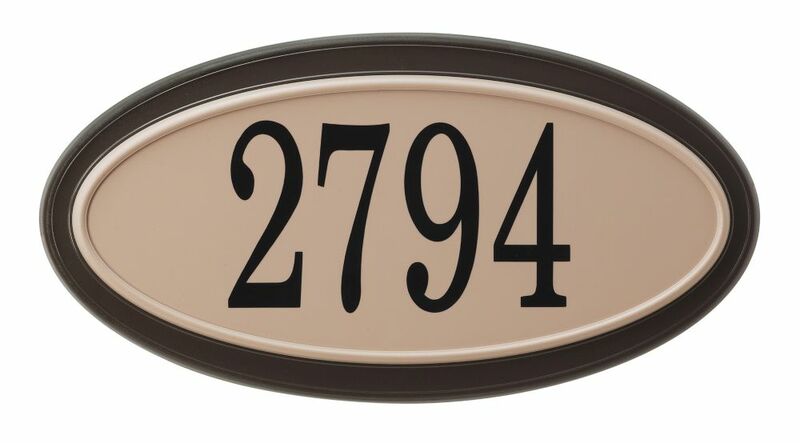 The Classic oval address plaque by PRO-DF will match perfectly any property styles. This plaque is made of high quality plastic, it will preserve its finish year after years, even under the harshest weather conditions. Each address plaques include a number kit, which contains 30 self-adhesive numbers, with a template for an easy installation. The numbers are made of weather resistant vinyl. This plaque can accommodate up to 5 numbers and the mounting hardware is included. Add curb appeal to your home with this attractive and timeless classic style frame. Crafted with a weatherproof solid cast aluminum frame for a long-lasting life, this plaque kit is highly visible during the day, while a unique reflective surface enhances visibility at night. Easy to install with 36 black self adhesive numbers included, this kit has an easy-to-follow number template and all the hardware you need add classic style to the front of your home. The Gama Sonic GS-80 solar LED illuminated address sign makes home addresses visible day or night with bright green light. The GS-80 can accommodate addresses up to five characters in length; it comes standard with three of each number 0-9 plus the letters N, S, E, W. Contact Gama Sonic directly if the kit doesn't have the right combination of characters to support your address. The GS-80 is made of weather-resistant poly-resin and comes with hardware and instructions for ground and wall installation. No wiring is necessary. Just set it up, and let the sun charge the included solar-chargeable AA batteries via the sign's integrated solar panel. The address sign's five LEDs will illuminate automatically from dusk to dawn on a full solar charge. When the batteries are run down, it takes about 10 hours of sunlight on the solar panel to achieve a full recharge. The Classic lighted address plaque by PRO-DF is made of weather resistant plastic with a deep bevelled frame and a rich textured surface. This plaque is designed to maximize your home's curb appeal, while keeping a lid on costs. It comes with two LED bulbs that uses less power than standard incandescent bulbs. Your address will be visible at over 100 feet away, day or night. Easy to install, it attaches to any existing doorbell systems (low Voltage). Included: 4 inches numbers, mounting hardware, two incandescent bulbs and two LED bulbs. The Economic vertical locking mailbox by PRO-DF is the perfect combination of, convenient, safe and affordable. To keep your mail safe, this mailbox feature a second locking lid, located under the top lid. Made of impact resistant moulded plastic, with a textured finish. The vertical conception is ideal for small spaces like: condo or townhouses. This mailbox will match perfectly any property styles. Plus, you can easily stick your civic number on the mailbox with the integrated address plaque on the center part. Included: mounting hardware and two keys. Assorted newspaper hooks and numbers sold separately. Oval Address Plaque, Mocha/Sand The Classic oval address plaque by PRO-DF will match perfectly any property styles. This plaque is made of high quality plastic, it will preserve its finish year after years, even under the harshest weather conditions. Each address plaques include a number kit, which contains 30 self-adhesive numbers, with a template for an easy installation. The numbers are made of weather resistant vinyl. This plaque can accommodate up to 5 numbers and the mounting hardware is included.